Leucocoprinus birnbaumii is a fairly common mushroom found in many tropical and subtropical regions, while in temperate climate it can grow indoors, alongside potted plants. Perhaps unsurprisingly, given that the English language is predominantly spoken in the climatically milder zones, it is sometimes called “plantpot dapperling”, “flowerpot parasol” or “yellow houseplant mushroom”, even though in most parts of the world it occurs outdoors. 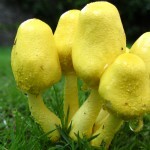 In Taiwan the mushroom is called 純黃白鬼傘, which can be literally translated as “pure white-yellow ghost umbrella”. 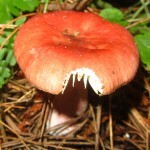 It is mildly poisonous and it might cause severe stomach problems if consumed.